The classroom environment provides opportunities for children to practice cooperation. Give each child a handful of straw pieces. Teacher should have the pile of pipe cleaners. The teacher will take one pipe cleaner and put a straw piece on it, then pass it to the next person. That person will put a straw piece on the pipe cleaner and so on and so forth until the pipe cleaner is filled with straw pieces. This should be done with all of the pipe cleaners. Students should understand that each bracelet is different because each person added something unique to it. This makes each bracelet different, but similar. 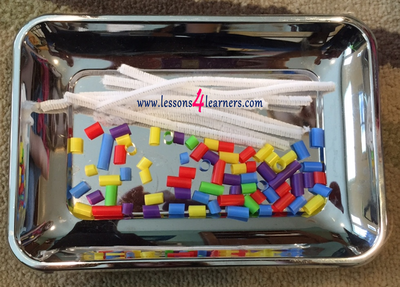 Use this in smaller groups and have children give a compliment for each straw piece. The three-year-old is generally ready to sit a little longer. However, a fifteen minute circle time can still be a challenge and inappropriate for this group. Just because you can make them sit that long, does not mean that you should. The three-year-old is more likely to want your approval, and may respond best to direct positive reinforcement. Talking about how someone else is sitting will not be as influential to the three-year-old as smiling and giving that child a thumbs-up. The three-year-old wants you to see them, give each child as much eye contact as possible, and you will reduce behavior mishaps. Doing this strengthens the bonds between teacher and student which then creates a sense of security and trust. This helps students feel the same sense of trust and security as they do at home which makes them feel like part of the community. This can build empathetic skills toward their peers and also create a feeling of acceptance which is very important to build confidence. Language skills are expanding at an incredible rate; this is the time to scaffold the language and the knowledge of the three-year-old. This group still needs a lot of movement and action to stay engaged. Whenever appropriate, give this group something to hold on to or to interact with during the lesson. For instance, while you are reading a book about animals, give each child an animal represented in the book. When that animal appears, ask if anyone is holding one, and have them hold it up. Try to ignore children playing and making animal sounds with their friends. It is all part of engagement and developmentally appropriate. The four and five year old love to learn. This group can manage a twenty-minute circle if it keeps moving and you include time to get up and wiggle in-between direct learning segments. Movement, interactive and relevant learning are still necessary to keep their attention. If you can plan your teaching to include things you know they are already interested in, the children will find it easier to stay on task, and internalize what you are teaching. Most four and five-year-old children are already aware of the rules involving circle time. That being said it does not mean that any given child on any given day will be able to accomplish them. Many factors influence a child’s behavior: learning style, temperament, physical or emotional challenges. Appropriate planning and presentation for your unique group of children will reduce behavior challenges and increase their ability to learn.